This is one of those nice little jobs that allow you to exercise your skills on a "one off" item that is unlikely to be available from any other source. The customer was a longstanding friend who was frequently to be seen doing bricklaying jobs at my house when not indulging his passion for gardening. 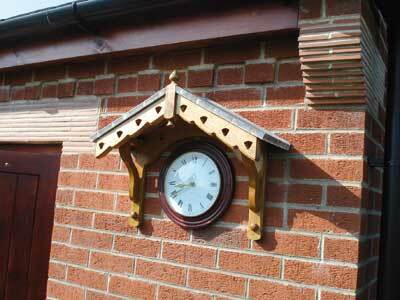 The clock was a gift that he wanted to fix to a wall and protect from the weather with some sort of roof. His sole contribution to the design was to mutter "oak" and "you'll think of something" while making a roof shape with two hands. I decided that a small porch type construction with some shapely "gallows brackets" to support it would be appropriate. A pitch of approx 33 degrees seemed to suit the job in hand. I decided to make the top surfaces out of 12mm (1/2") ply in the first instance and see what a temporary assembly looked like. 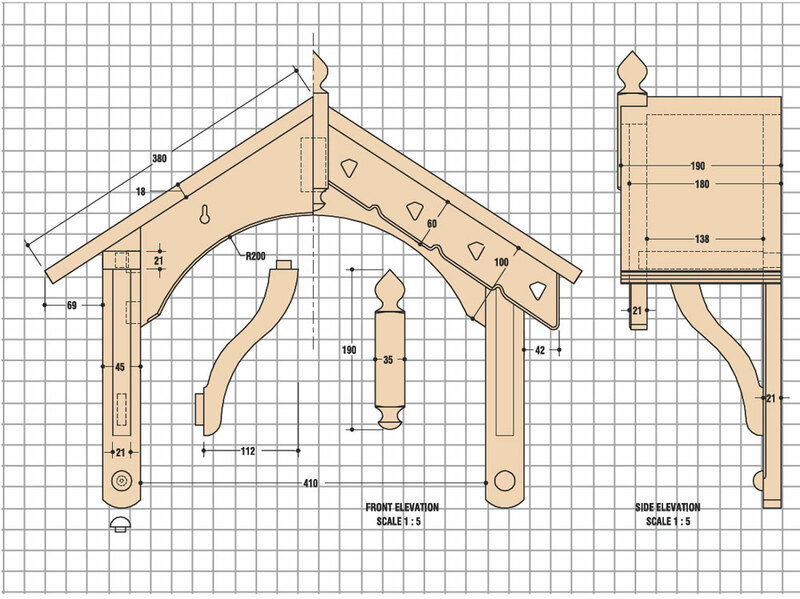 A full size drawing was made of the front elevation and side view on a sheet of veneered MDF to check the appearance, and allow the sizes and angles to be lifted off (pic 1). From this drawing, a cutting list was prepared, and my store of short lengths of kiln dried oak was raided for the materials, all of which were face and edge planed and thicknessed to size. 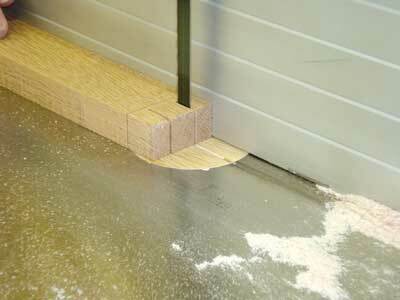 The shorter lengths required were left as longer lengths for safety and ease of handling (pic 3). The gallows brackets were first, a mortise and tenon joint being used between the horizontal and vertical rails (pics 4 & 5). I left the existing 9mm (3/8") chisel in the mortising machine, and reversed the work piece, in order to get a 15mm (5/8") wide mortise. When this joint had been dry assembled and checked for square, the shaped angle bracket was placed on top of the assembly and the shoulder lines were marked on in pencil and then squared round and knifed in (pic 6). 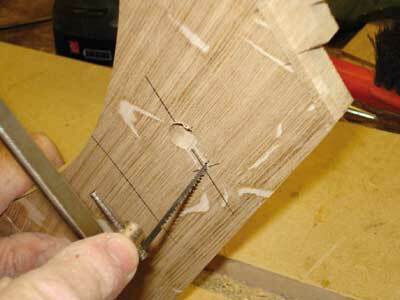 I left the angle bracket in its square shape until after cutting the tenons on the ends, and when the tenons had been completed, I drew on the required curves. 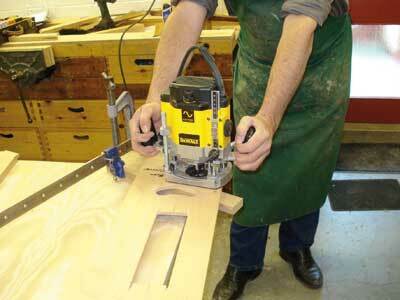 For aesthetics, the curved shapes were allowed to run thinner in the centre of the bracket. 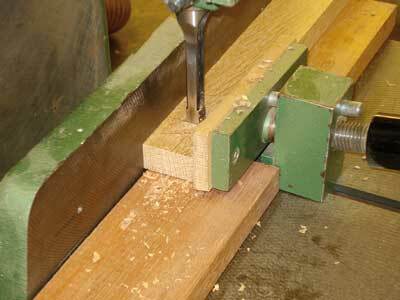 The curves were cut on the band saw and cleaned up using a sanding device in the lathe; the tenons were trimmed square as required, before returning the finished angle bracket to its original pencil lines to mark on the sizes of the mortises. 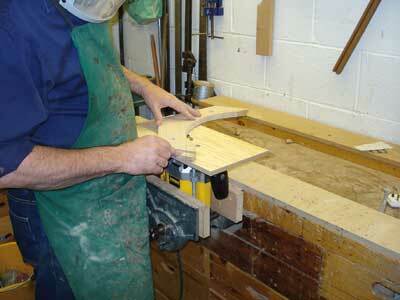 The mortises were cut at 9mm (3/8") to match the tenons and the brackets dry assembled. For the two 100mm (4") wide "rafters" at the back, mortise them into the vertical rails of the gallows brackets and fasten together at the top with a loose tenon. To solve conflict between the two mortises at the top of the vertical rails cut away a small part of the rafter tenons to allow the smaller tenon on the gallows bracket to pass through (pic 7). The finial was turned to size and mortised out to take the facia boards; the three components being dry assembled and placed face down on the working surface. The rear rafters, which had now been glued together at the top and cut to shape on the bottom edge, were dry assembled with the vertical members held in place with a sash cramp. 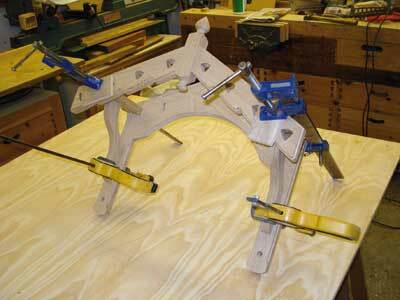 This assembly was now placed face down on top of the facia to allow the positions of the rear mortises to be marked through, used to locate the mortises in the back of the facia boards. 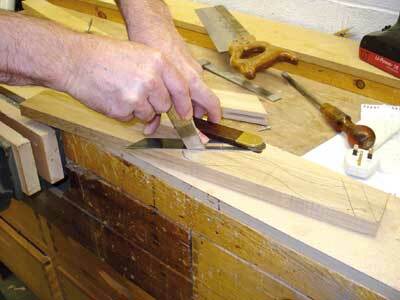 The position of the mortises was moved inward to make the front tenons bare-faced (pic 9). 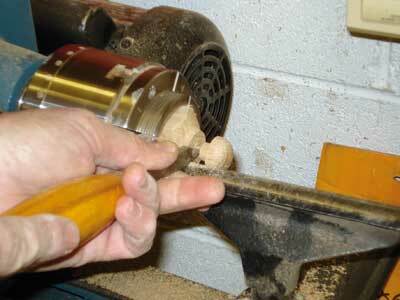 These blind mortises were drilled out with a forstner bit and squared off with a chisel; the matching tenons were cut using the cross cut for the shoulders and band saw for the cheeks. 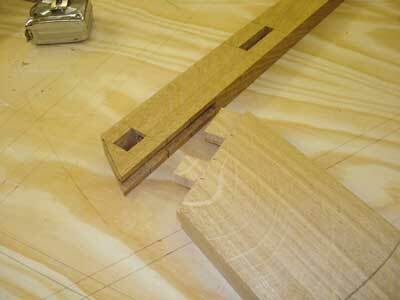 The decorative holes were cut with the router fitted with a 6mm (1/4") two flute cutter and 30mm (1 3/16") guide bush (pic 9). When I was satisfied with test hole, the template was cramped to the front of the facia boards and plunged through 6mm (1/4") at a time. The facia boards were given a shaped bottom edge using the band saw and the resulting edges were cleaned up with spoke shave and sandpaper. I cut screw holes and slots in the rear rafters to allow the completed item to be lifted off the wall if required (pic 11); the bottom edge was finish sanded using a spindle moulder. 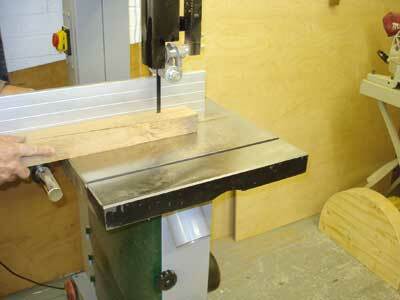 I decided to run a small cove mould on some of the square edges using an inverted router (pic 12). To help prevent the accidental moulding of the wrong bits, I marked the parts of the edges to be moulded with a black felt tip pen. 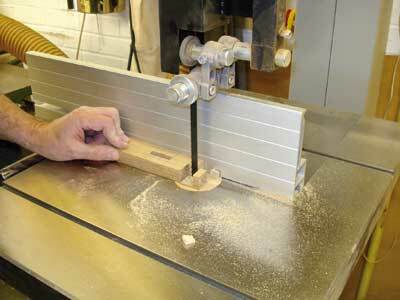 Once everything is hand-planed and sanded, glue up! 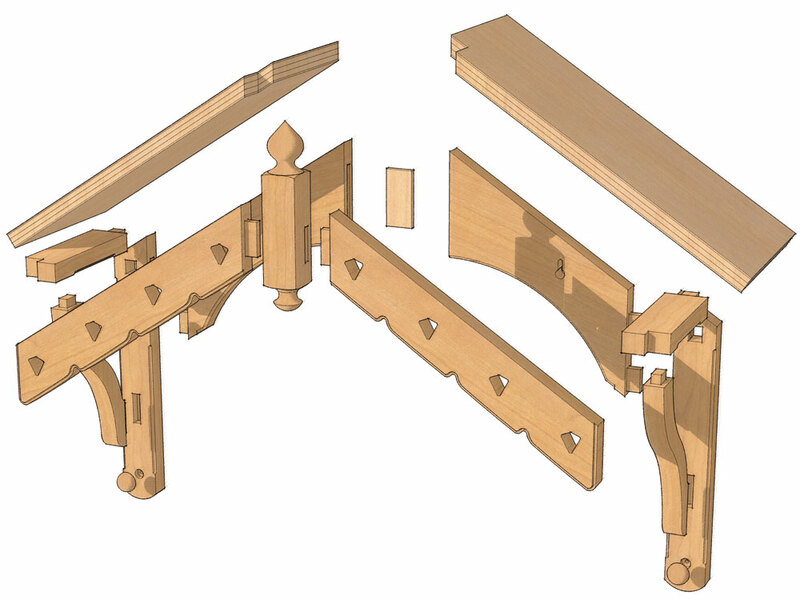 The rear rafters, which had already been glued together, were glued and cramped to the vertical parts of the gallows bracket to make a rear sub assembly, the front fascias and finial forming the front assembly. 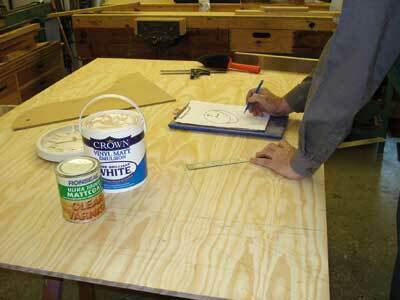 After the glue had set, the remaining parts were glued, assembled, and left overnight (pic 14). In the absence of a tame plumber I was obliged to have a go at the roof covering. A search of the deeper recesses of the ironmongery cupboard produced a supply of galvanized felt nails which would serve to fasten the sturdy lead covering in place. When the lead had been cut and shaped to fit, it was placed to one side while the whole construction was given an initial coat of exterior varnish, suitably thinned with white spirit to ensure good penetration. All that was left was to apply a final exterior varnish, and fix the whole construction to the wall! One final piece of decoration was added in the form of two turned imitation "fixings" at the bottoms of the gallows brackets. 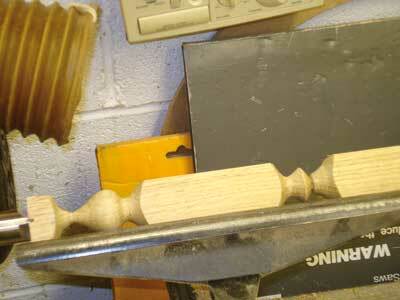 These were turned using a "four jaw" chuck on the lathe. 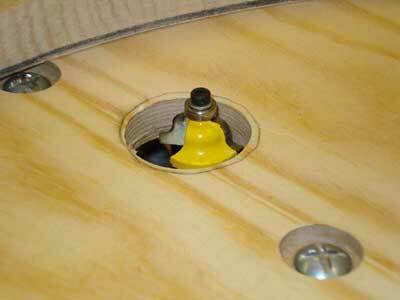 A 12mm (1/2") spigot turned on the back of each "button" was glued into a blind hole drilled in each upright. The 12mm (1/2") ply for the roof didn't look adequate anymore, so I increased it to 18mm (3/4") and screwed it in place. "I decided that a small porch type construction with some shapely "gallows brackets" to support it would be appropriate"